Includes: bra, skirt, arm bands, wrist cuffs, necklace, headband, half-circle chiffon veil. Fabric is blue heavy crushed velvet and blue chiffon. 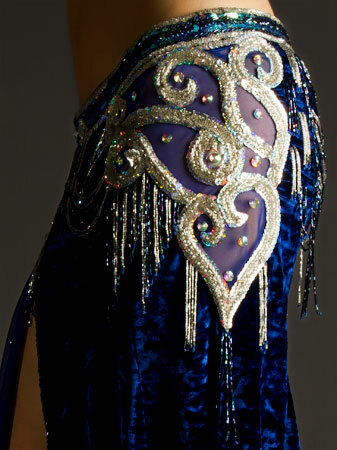 Beading: blue and silver; AB crystal stones. Bra: B/C cup, cutouts on one side. 35" from end to end under bust. 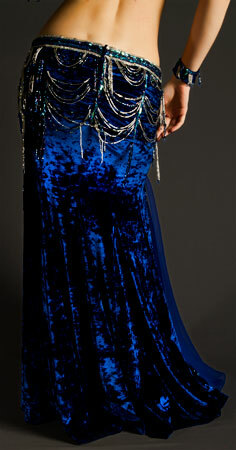 Skirt: fitted velvet skirt with one slit and chiffon panel. Cutouts on the left hip. Upper hip 34", lower hip 38", length 38".